Iced Orange-Cranberry Biscotti are a delicious dairy-free dessert that’s easy to make and elegant to serve. A great homemade gift to bring to a friend’s house for brunch or to wrap as a holiday gift. Biscotti, or as I grew up calling it and it’s known in the Jewish tradition, mandel bread, looks so fancy, but is shockingly easy to make. You know how I know? I am far from a baker and I made it. And it came out good! I made these Iced Orange-Cranberry Biscotti as dessert for an anniversary dinner I cooked for my husband this past June. The inspiration came from Deanna Segrave-Daly, a fellow registered dietitian and and one of the co-creator of The Recipe ReDux. She shared her Iced Lemon Biscotti Bites for the June ReDux and I thought they didn’t seem too difficult and I had all of the ingredients on hand, so why not give it a shot. My husband always complains I don’t bake, so this would make him happy, and it sure did! In typical fashion, I couldn’t leave well-enough alone with a recipe that already existed – even one from a RD! I love Deanna and her recipes, but I think she would agree that part of the fun of recipe development is tinkering with recipes and making them your own. I had a juice orange in my fruit basket and some dried cranberries in the pantry, and we all know cranberries and orange go so well together – just take a look at my Cranberry Orange Bread and Orange-Ginger Cranberry Sauce if you don’t believe me! 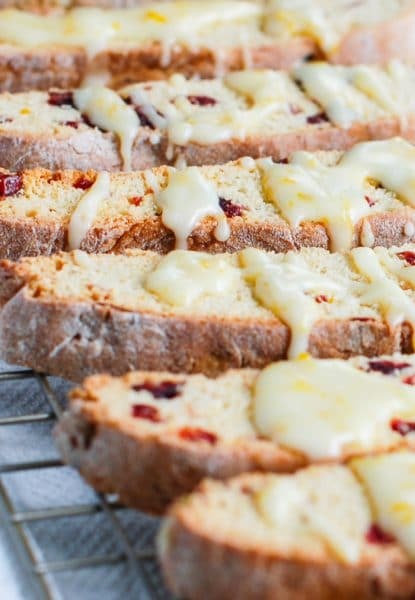 Making the batter of these Iced Orange-Cranberry Biscotti is very similar to making a quick bread – you mix the dry ingredients in one bowl, the wet ingredients in another and then mix them together. From there making biscotti differs. You divide the batter in half, rolling each half out into a log that then gets partially baked. Once the logs have cooled a bit, you slice them and lay them flat on a cookie sheet to bake some more. While the biscotti are in their second and final stage of baking you can mix together the icing, which consists of powdered sugar, orange juice, and orange zest. So easy! 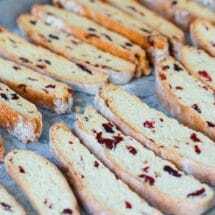 Drizzle icing on the cooled biscotti and there you have it – Iced Orange-Cranberry Biscotti that were easy to make, yet impress every audience! One of the things I love about this recipe and that I want to point out is that it’s dairy-free. This is something I always look for in baked goods since I keep kosher, which means when we have a meat meal I don’t serve any dairy at the same time. I know this is helpful for many others who are on a dairy-free diet as well. 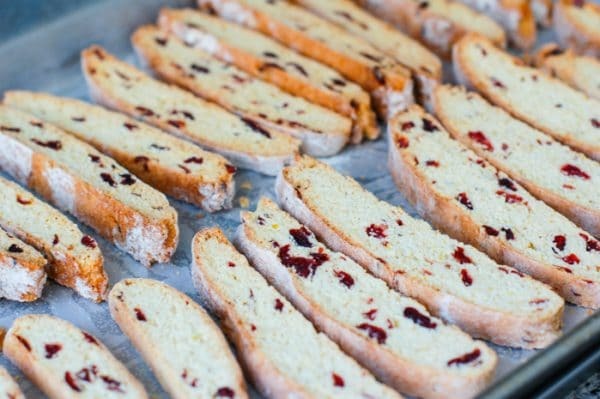 Iced Orange-Cranberry Biscotti are a delicious dessert that's easy to make and elegant to serve. A great homemade treat to bring to a friend's house for brunch or to wrap as a holiday gift. In a large bowl, mix together flours, sugar, baking powder, salt, and chopped dried cranberries. In another bowl, mix together oil, orange juice, orange zest, and eggs. Pour wet ingredients into dry ingredients, mixing until batter just holds together. Divide the dough in half. On a floured surface, roll out dough into a 12-inch long x 2-inch wide x 1/2-inch thick log. Repeat with other dough half. Line cookie tray with wax paper and place logs on top. Bake for 25 minutes. Remove from oven and transfer logs to rack. Cool for 10 minutes. Using a serrated knife, slice logs into 1/2-inch wide cookies. Place back on cookie tray and bake for 20 more minutes, turning cookies over half way through baking. Remove from oven and place on racks. Cool completely before icing. While cookies cool, whisk together powdered sugar, 2 tablespoons orange juice, and remaining orange zest. Once cookies are cooled, drizzle icing over cookies. Let icing harden for about 30 minutes before serving. Store in an air-tight container for up to a week. What’s your favorite biscotti flavor pairing? We made so much biscotti one year but it was all chocolate, marshmallow, and or peppermint. I love cranberries and cranberry orange is such a great combo! These would be perfect with coffee this holiday season! Can’t wait to make these! That sounds so delicious, Sarah, especially the marshmallow! Let me know if you give these a try – I know you love cranberries!! You’re the inspiration and I will forever be grateful to you for getting me to make these!! Thanks Emily! Let me know if you give them a try! I think you should! I am NOT a baker at all, so if I could do this so can you! I love the orange-cranberry combo! I recently made biscotti for the first time too and was shocked how easy they are. Now I want to make another batch just for that orange drizzle! It’s such a great flavor combo, isn’t it?! What kind of biscotti did you make? I couldn’t believe how easy it was compared to what I was expecting! LMK if you make these!